Photo taken at night, the color is sadly off a bit in this picture. 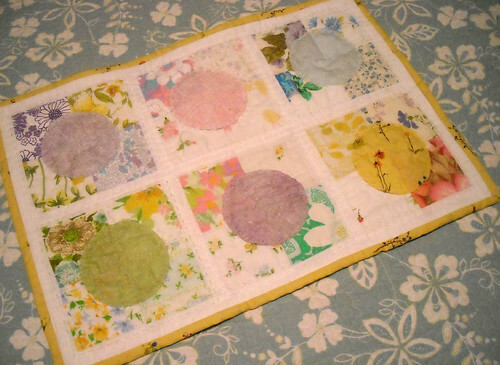 Circles were appliqued and quilted in one step, by hand, with embroidery floss. 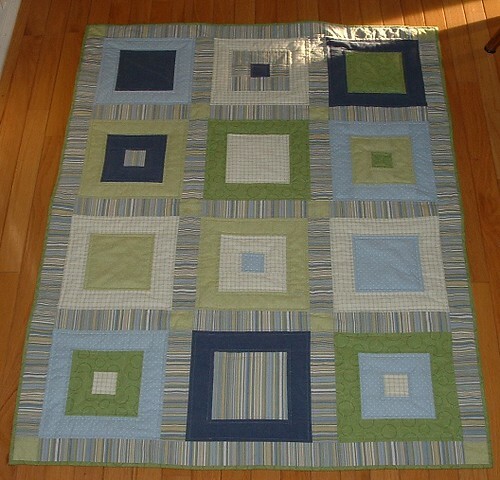 All the quilting was done by hand. I haven't named a lot of my quilts but I decided this one was to be called "Summer Breeze" because it's made mostly of vintage bed linens. And maybe several of them spent some time on the clothesline a long time ago. This was given to TDK Katie for the sewingmamas.com summer 2009 doll quilt swap. I haven't swapped there for ages but this was a good one and I'm glad I joined in. These are from Weekend Sewing by Heather Ross. Made from a cute sheet I got at goodwill a while back. The pants are so, so comfy. 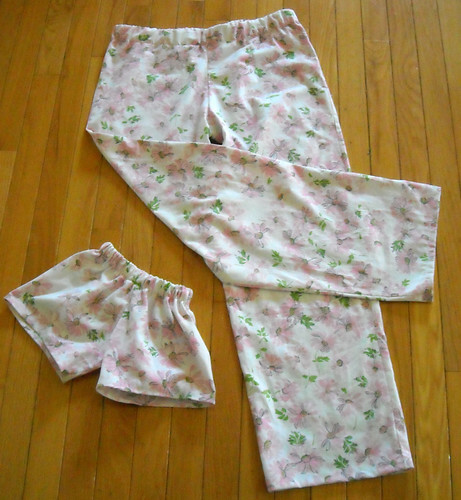 The bloomers need leg elastic, I found a good deal on a 144 yard roll (that ought to be enough), so as soon as that comes, they'll finish up quick. A few 9-patches. 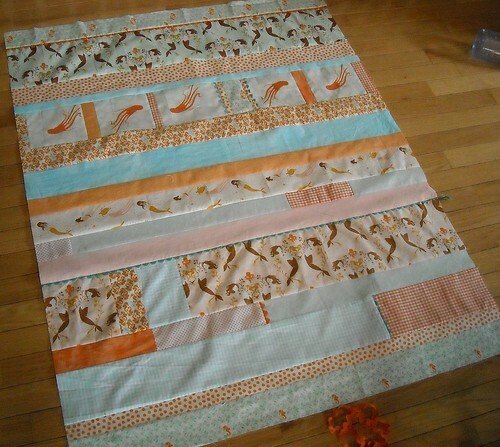 I'm not exactly following AmandaJean's quiltalong, but eventually will make something inspired by this. I made 6 more of these after taking this picture. This is baby L and the quilt I received from Katie for the sewingmamas.com doll quilt swap. I really like all that pink and green. 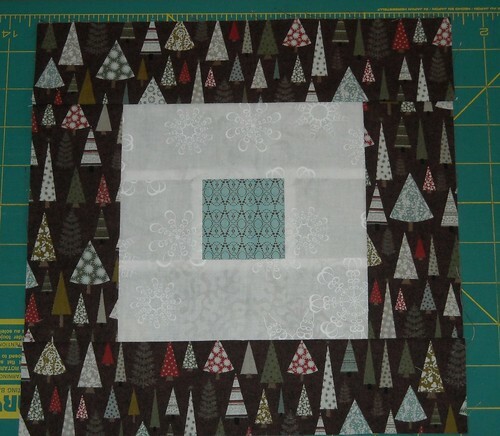 And the strips and straight line quilting. 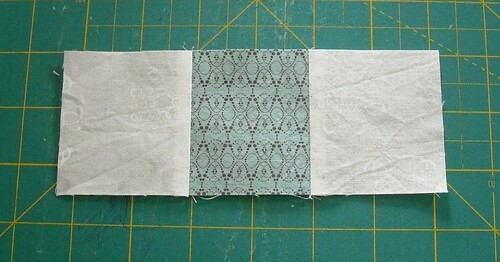 And that dotty binding. :) I have a busy week ahead but hope to post about a few other things I've finished in the next couple days. 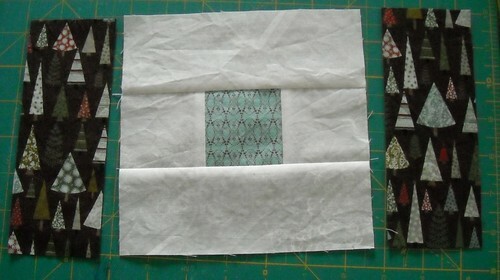 I have another quilt block tutorial photographed, too. All right, here we go with block B. This block is comprised of 3 concentric squares. 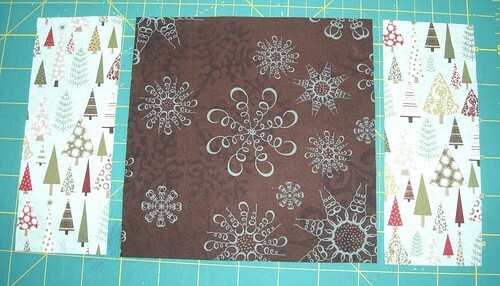 I used three fabrics in this sample block, and I'm calling them "inner, middle, and outer" here. 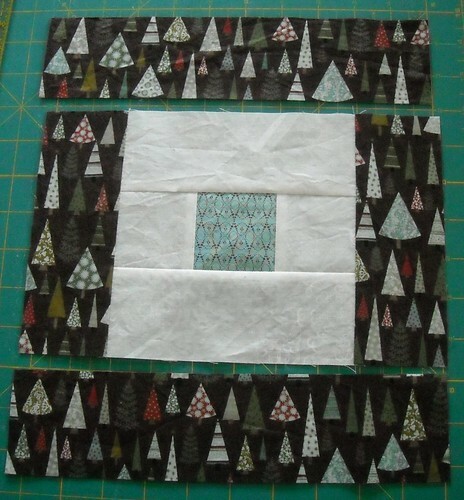 You could make this block with two fabrics if you want--one for both inner and outer squares and a contrasting fabric for the middle square. Maybe I'll try that on another block soon. 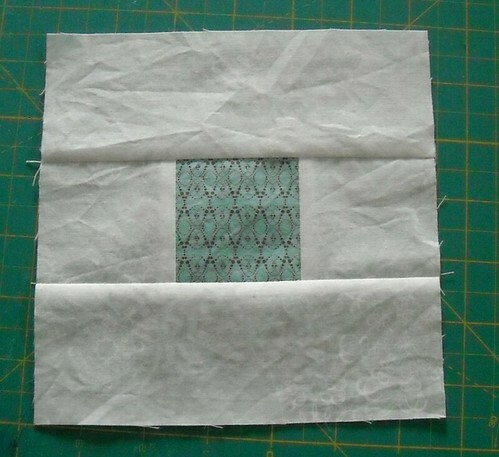 Step 1: Cut a 2.5" square from your inner fabric. 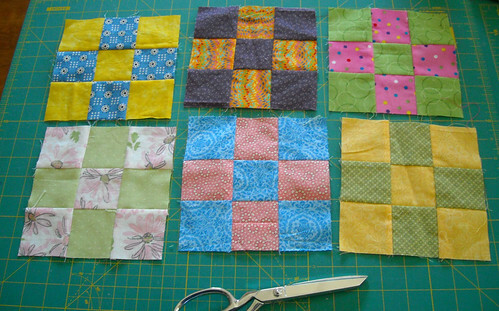 Cut two 2.5" squares from your middle fabric. 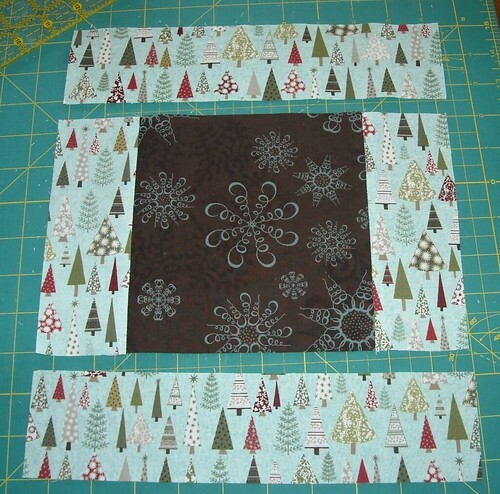 Step 2: Sew the middle squares to two sides of the inner square. Press. Step 3: Cut two 2.5"x6.5" strips from your middle fabric. 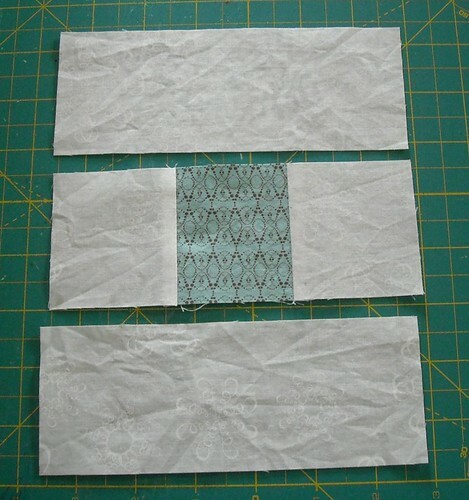 Step 4: Sew these strips to the top and bottom of the block. Press. Step 5: From the outer fabric, cut two strips 2.5"x6.5". 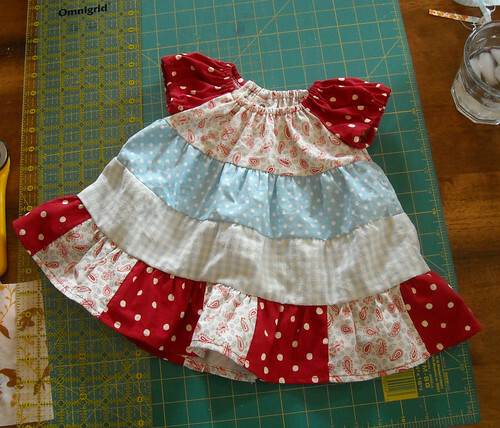 I used fabric with a directional print again so I had to pay attention to which way I cut my strips here. 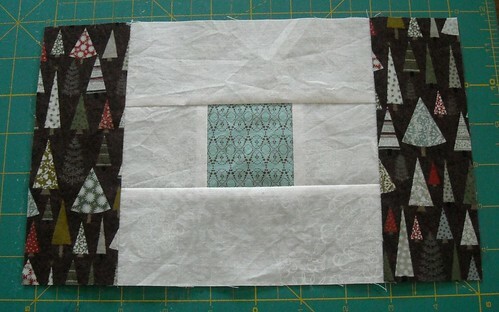 Step 6: Sew the 6.5" strips to the sides of the block. Press. Step 7: From the outer fabric, cut two strips 2.5"x10.5". I cut these strips so the directional print is going the same way as the side strips. 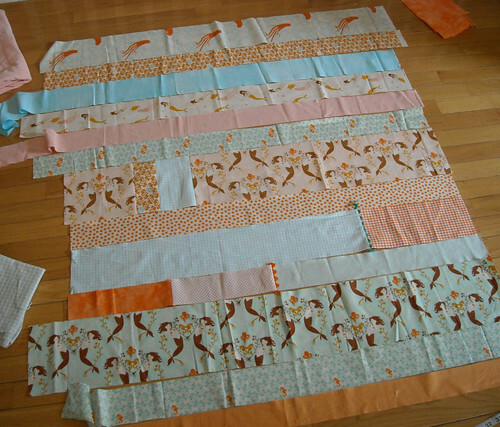 Step 8: Sew the 10.5" strips to the top and bottom of the block. Press. p.s. If you're wondering, I still don't have the right name for this quilt pattern. I'm thinking about it and it will come to me eventually! 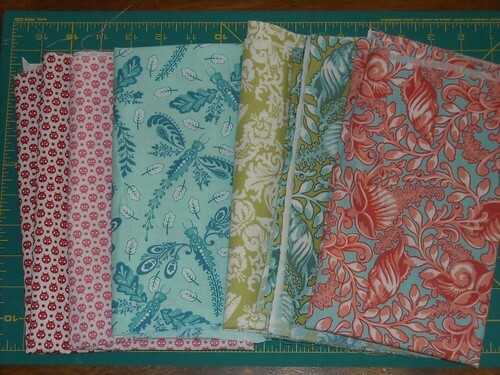 I have admired the Neptune fabrics for a long time so I was glad to get them, and the bugs are by the same designer, Tula Pink. I am working on a bit of pink and aqua and red stash I guess. This past week the boys had swimming lessons and somehow that seemed to take a big chunk of my time. I worked on a swap quilt for the SewingMamas.com doll quilt swap... It is all hand quilted and I really like it. It is -this- close to done and I'll post a picture of it after the recipient gets it. I went through my sewing stuff (in one location, there is more in my bedroom closet) and folded and packed it away more neatly. I made a list of started projects and projects I hope to start soon. I need to start making a dent on that UFO list. Oh I also took my Viking in to the shop yesterday. It is my only machine with a walking foot so when I get it back I will be able to finish something I started quite a while ago. 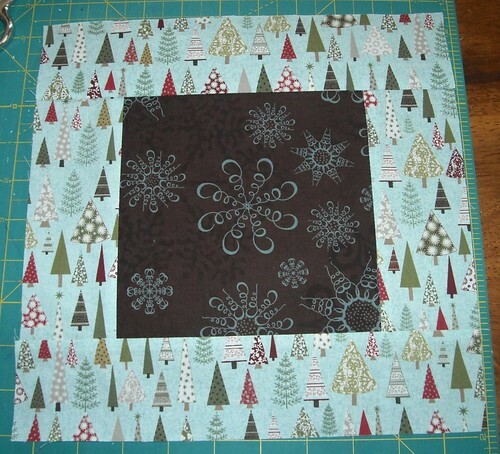 Jan at Creative Instigation is hosting a brainstorming session for the name of this quilt here. I like the ideas so far, and have another possibility I came up with myself, but I'm still open for suggestions if you have them. So. 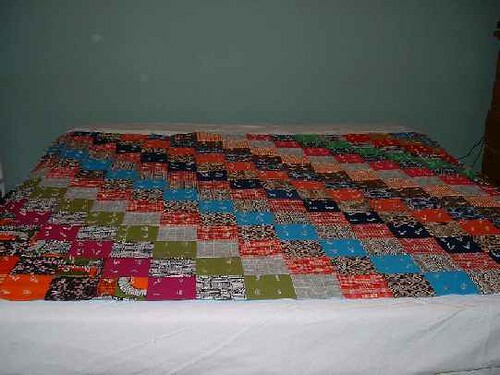 Here is my original quilt-along post that includes yardage requirements for making the quilt as pictured. Step 2: Sew the strips to the center piece using 1/4" seam allowances. Press seams. Step 3: Cut two more strips, for the top and bottom of the block, that are 10.5"x2.5 I used a fabric with a directional print (is that a word?) so I needed to cut these strips the opposite way from the side strips. Step 4: Sew the strips to the block top and bottom using 1/4" seam allowances. Press seams. Done! Let me know if you make any of these blocks, I'd love to see them! After it was off the frames, I wasn't in love with the quilt, and I just put it away with unfinished edges, for a long time. My grandma passed away about 5 years after we made this quilt, and soon after her death I got the quilt out and finished up the edges by just folding them in and zigzagging close to the edge. 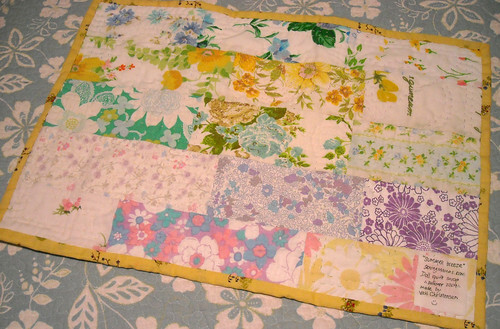 I like the quilt a lot, because of the memories of my sweet Grandma that it holds. I call it my "ugly quilt" and I tell everyone about it, and about my grandma. I still use it on my bed every winter. My kids' handprints for my mom, for mother's day. This is what I'm working on today. 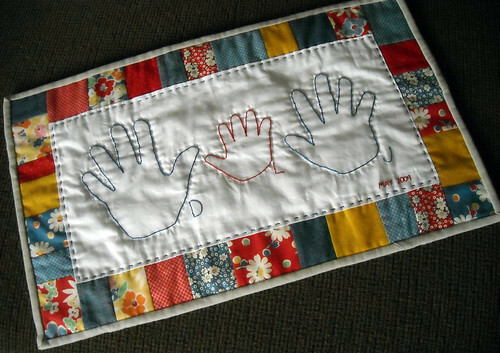 Baby quilt for sweet Miss L., made from Mendocino fabrics by Heather Ross. I'm taking a lot of time to think about it. Maybe too much? I don't know. Some of the oranges don't go together so well but hopefully I can pull it off and make it look good in the end. 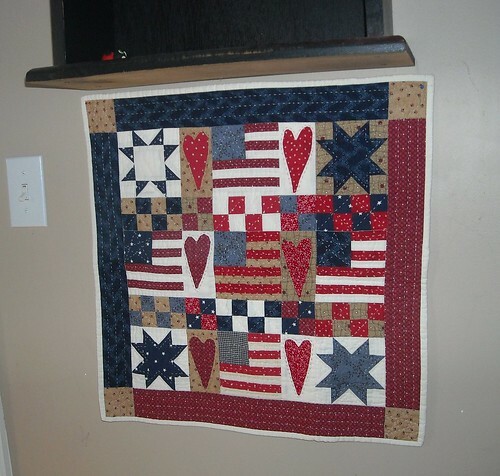 I just saw some cute 4th of July quilts on Freda's Hive and it reminded me of an old patriotic mini-quilt I made long ago. I think I'll go get it out so I can take a picture for tomorrow.